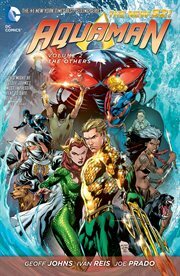 The item Aquaman : volume 2 : the others, Geoff Johns, writer ; Ivan Reis, penciller ; Joe Prado, inker, (electronic resource) represents a specific, individual, material embodiment of a distinct intellectual or artistic creation found in Lawrence Public Library. Long before the King of the Seven Seas joined the Justice League, Aquaman was a part of another super-team: The Others. These young costumed adventurers traveled the globe, each trying to find their own individual road to redemption. Six years later, after a grisly murder, The Others are reunited. They know only one man could be responsible: Black Manta. Aquaman must lead the charge to stop his arch-nemesis, but will the years have fractured The Others just enough to keep them from bringing this villain to justice?